People who seek out good and evil tattoo designs are often trying to depict the dichotomy that many religions and cultures deal with as a morality conflict. The dualism of good versus evil is expressed throughout historical references in literature, artistry, religious practices and more. With so much interest in the great conflict, it's not surprising many people find it worthwhile to obtain some form of good and evil tattoos. These unique tattoos serve as a reminder of the struggle that plagues mankind. One of the many beauties of tattoo artistry is the freedom to be as creative and unabashed in personal expression as you wish. After all, it's your skin you are permanently marking! Since this freedom is so widely accepted among aficionados, good and evil tattoos come in many diverse and creative forms. Listed below are simply a few of the many possibilities. 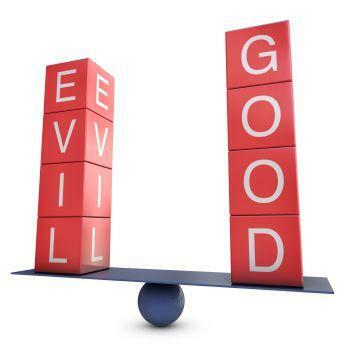 One very classic theme used in the good against evil design is the angel and devil. Some wearers use the opposing imagery on opposite but symmetrical sides of the body. For example, a potential tattoo receiver may decide to have one angel on the right shoulder and one devil on the left. Many religious texts use right and left to represent good and evil respectively. This is merely symbolic; however, this attribute is often used when completing an angel and devil tattoo design. Many tattoos incorporating good and evil use two contrasting images such as an innocent and happy, lively face alongside with a grim and daunting skull. This style of tattoo portrays an obvious disparity of characteristics and embellishes the theme of good against evil. Placing the two faces together is used to express the duality of the two morals found within one person. It is not uncommon to see a tattoo depicting an entire face as fifty percent evil (skull) and fifty percent good (lively face). Elaborate tattoo designs have been etched into skin portraying the opposing sides of heaven and hell. A wearer may choose to utilize softer lighter colors, feathery techniques and angelic features in the depiction of heaven on his or her upper back. Subsequently, the wearer uses dark deep colors, sharp lines and frightening imagery on the lower back to display the pains of hell. This tattoo is also seen on right and left sides of the back and even on opposing arms or legs, depending on the desires of the recipient. There have been a number of demon tattoos that are accompanied with non-demons. A wearer may decide to use this artistry to portray the plague of evil surrounding the lives of unsuspecting normal bystanders. As with all tattoos, a design of good against evil can be fashioned without limitations of color and imagery. It is important that you decide which pictures are most meaningful to you and which figures denote good and evil in your own eyes. If you are inspired by another person's ink, use that inspiration to determine what will be most suitable for your purposes. Each day a new piece of art adds to your broadening artistic mind, so have fun and be creative!